Calcutta high court on Thursday refused permission to the Bharatiya Janata Party for holding a 'Rath Yatra' in Coochbehar, which was to be flagged off by the party president Amit Shah on Friday, after the West Bengal government refused to allow the event saying it may cause communal tension. 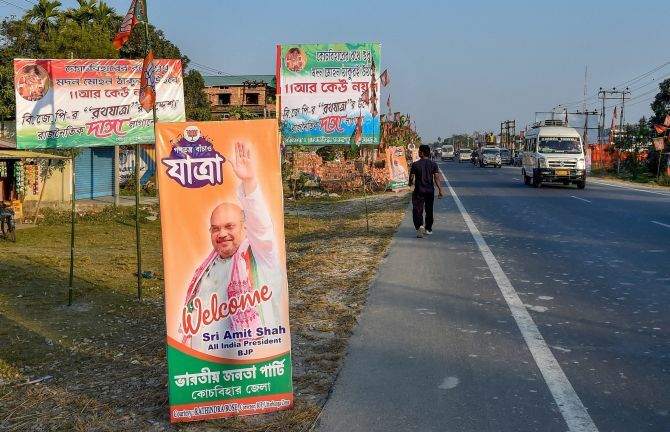 The Bharatiya Janata Party decided to put on hold Shah's proposed rally and the Rath Yatra, saying it will wait for the final order from the high court, which will now hear an appeal by the saffron party on Friday morning. In New Delhi, the BJP spokesperson Sambit Patra accused West Bengal Chief Minister Mamata Banerjee of running a ‘dictatorship’ in the state and alleged her government refused the permission as she was busy playing ‘politics of appeasement’. The BJP campaign, which the party has named 'Save Democracy Rally' and has projected it as a ‘game-changer’ in Bengal politics, was scheduled to begin from Coochbehar district in the north on December 7, from Kakdwip in South 24 Parganas district on December 9, and from Tarapith temple in Birbhum district on December 14. "If something happens, who will be responsible?" Justice Chakraborty asked whether it will be possible to make security arrangements within the short time of less than a day. The court is concerned about the safety of the people, he said. BJP counsel Anindya Mitra submitted that a division bench of the high court had in January allowed another set of motorcycle rallies by Bharatiya Janata Yuva Morcha after putting certain conditions and prayed that similar order be passed in this case also. The AG told the court that the Coochbehar SP has refused permission for the rath yatra. He said the district has a history of communal issues and that there was information that some ‘communal provocators and rowdy elements have become active’ there and expressed apprehension of breach of peace. The AG said the refusal of permission was an administrative decision in view of the ground situation and ‘details of apprehension’ cannot be spelt out in open court due to their sensitive nature. The BJP counsel submitted that the Constitution guarantees the right to hold political programmes and that assumption of untoward situation cannot be a ground for refusal. When the judge asked if he was agreeable to deferment, Mitra answered in negative and said the party had started preparations a long time ago and had approached the administration for permission in October itself. In Coochbehar, BJP general secretary Kailash Vijayvargiya said that BJP is a ‘responsible political party’ and it will obey the court order. There was disappointment in the BJP camp after the court order, leaders said, adding massive arrangements were made for the Rath Yatra, which would be a ‘game changer’ in West Bengal politics. West Bengal BJP president Dilip Ghosh's vehicle was attacked on Thursday at Sitalkuchi area of Coochbehar district by unidentified miscreants. Ghosh is in the district to take part in the scheduled 'rath yatra'. He was attacked when he was on his way to Mathabhanga in the district. "Trinamool Congress leaders attacked my car and shouted slogans demanding that I should go back. Some of my party workers were injured during the violence. "The police were watching merely as mute spectators," he said after the incident at Sitai More in Sitalkuchi. The district police administration said they are looking into the incident. BJP spokesperson Sambit Patra said Chief Minister Mamata Banerjee, also the president of the Trinamool Congress, was busy playing ‘politics of appeasement’ and that is why her government blocked programmes of Shah and Rashtriya Swayamsevak Sangh chief Mohan Bhagwat earlier. "We are often forced to move court for seeking permission. Courts reprimand the state government every time, but she does not learn her lessons because she is busy with politics of appeasement," Patra told reporters at a press conference. She is running a dictatorship, he alleged. Shah, he noted, has said that the BJP will win 26 of the 42 Lok Sabha seats in the state.